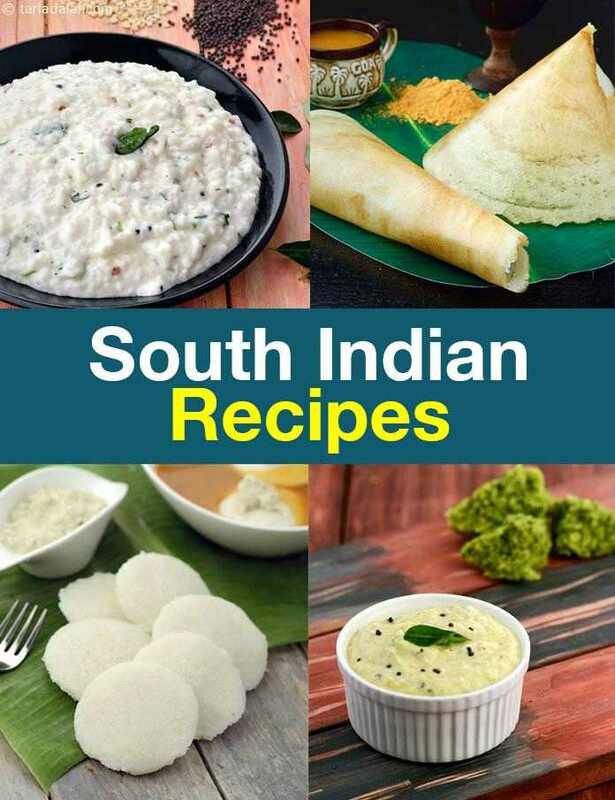 South Indian Recipes, 950 South Indian Dishes, Food Recipes. An acquaintance had this irksome habit of referring to all South Indians as “Madrasis”. And one fine day she stopped saying so. In an attempt to quell my curiosity I asked – and got to know that after a tour of South India she realised there is so much diversity down South that it is just not fair to generalise – the best example being South Indian cuisine. South Indian cuisine and food habits are so varied that it is common for a person to feel lost in the menu of a neighbouring state. Say, when a person from Tamil Nadu attends a wedding in Andhra Pradesh, it is a common trick to keep an eye on the next person’s plate or banana leaf, to figure out what order and in what combinations the food is to be consumed! When one mentions South Indian food, idli, dosa and vada are the first dishes that come to one’s mind – and it’s fair enough because these dishes are popular in all the South Indian states. It is a daring risk to venture into the question of which state they originated in – so we will not touch upon that, but the fact remains that these are much-loved foods all over South India. Served with the quintessential Sambhar and Chutney, this “tiffin” platter is enjoyed any time of the day – for breakfast, evening snacks or dinner. A word that the British introduced us to, tiffin refers to snacks that are neither too light nor too heavy, and can be relished at any time of the day! When it comes to tiffin, there is a lot of similarity amongst the South Indian states, and we find many common favourites like idli, dosa, vada, uttapam, upma and pongal. Apart from these, each state has its unique offerings too – like the paniyaram and adai of Tamil Nadu, the aapam, puttu, avial and kadala curry of Kerala, neer dosa, kadubu, benne dosa and rava idli of Karnataka and pesarattu of Andhra. Apart from Sambhar, tiffin is usually served with chutneys like coconut chutney, coriander chutney, tomato chutney, etc., or dry chutney powders like the idli milagai podi or curry leaves powder. Rice holds a special position in the South Indian kitchen. More than a mere ingredient, rice or annam is given a divine connotation and treated with respect. In all South Indian states, rice is the staple grain served during lunch time. Some prefer to use raw rice, while others opt for parboiled or boiled varieties. Rice lovers that they are, South Indians can often tell the difference between rice grown in various regions and different river beds! At lunch time, the rice is freshly steamed and served hot with a spread of dal-based curries and vegetables. There is a lot of difference in the items served during lunch time, and the order in which they are served. Lunch is dominated by rice, which is served with dollops of ghee and a range of curries and dals. Depending on whether it’s a normal day or a special occasion, the number of items served may vary. When you see the word ‘pappu’ in a dish’s name, you can understand that it comprises dal. It may be plain or combined with veggies. Usually, a meal begins with rice mixed with pappu and enjoyed with a spicy oorgaya (pickle). Other main course dishes are koora (dry or semi-dry subzi), pulusu (sour and tangy gravy made of tamarind, tomatoes, sour curd or raw mangoes), pachadi (a spicy and saucy accompaniment), charu or rasam (a thin, soupy dish that is mixed with rice), curds, and so on. Pulihore, a peppy rice preparation with tamarind and spices, is much-loved by the Telugu folks and everyone who tastes it! A regular meal consists of vegetable preparations, a dal based preparation like sambhar, and saaru or rasam, ending with majjige (buttermilk). Kannadigas also love gojju, a featuring a unique blend of sweet, spicy and tangy notes. There are also one-dish meals like the Bisi Bele Bath, a hot and spicy rice preparation, made of rice, dal and veggies flavoured with a special masala and tamarind pulp. Karnataka within itself has several sub-cuisines like Udupi, Mangalore and Mysore, and a discerning diner can easily tell the difference between these. Don’t be fooled by the simple food that the Keralites have on a normal day – visit them on a festive occasion to experience the mind-boggling variety of the state’s cuisine. Kerala food is rich in all things coconuty! From coconut milk to grated coconut and coconut-based spice pastes, it is used in every possible form to make vegetable and curd-based curries. Yellow banana and jackfruit are also used abundantly in the region to make crispies, curries and desserts. Different regions of Tamil Nadu have different styles of cooking, the popular strains being Tanjore, Tirunelveli, North Arcot and Chettinad. However, a three-course lunch broadly consists of rice served with sambhar and/ or mor kuzhambu, then rasam and finally curd, accompanied by a range of vegetable dishes. If lunch is had out of a dabba, people often opt for what is colloquially known as ‘mixed rice’ or ‘variety rice’. Tomato Rice, Tamarind Rice, Sambhar Rice, Curd Rice and Peanut Rice are some of the common options. On special days, vada, kheer and pachadi (raita) are also served with lunch. Like the rest of the country, South India also loves sweets and snacks! From the Ela Ada and Unni Appam of Kerala to the Kajjikaylu of Andhra Pradesh, the Jangiri and Chakkarai Pongal of Tamil Nadu, and the Obbuttu and Mysore Pak of Karnataka, each sweet delight has a culinary anecdote to tell with distinct flavours, native ingredients and exclusive cooking techniques. Snacks are also an integral part of the South Indian food scene – they are enjoyed at practically any time of the day but mostly in the evening with a cup of hot coffee or tea. It is amazing how they never tire of having a steaming hot cuppa however sweltering the weather might be! But then, nothing can complement a Masala Vada, Mysore Bonda or Plantain Bajji as well as a cup of South Indian filter coffee or Chukku Kaapi (a tea of dried ginger and spices). Keralites enjoy snacking on steamed yellow bananas and Kattan Chaai (black tea). Every kitchen in South India is also well-stocked with pickles, dry chutney powders, vadams and papads (that can be roasted or deep-fried), which are served in perfect combos to make a simple meal seem like a special treat! If you are going to experiment with South Indian cooking, your kitchen needs to be stocked with rice, tamarind (or kokum), sambhar powder and rasam powder, ghee and cooking oils like groundnut, coconut or sesame oils. More importantly, you need to get your masala box or ‘anjarai petti’ (literally five-compartment box, although the modern ones have seven) equipped with mustard seeds, fenugreek seeds, cumin seeds, coriander seeds, sesame seeds, red chillies, broken urad dal and chana dal, as these are frequently used in South Indian cooking. These ingredients in different combinations are used to make masalas for South Indian curries. Sometimes, they are ground raw, while sometimes they are roasted and ground. The method and proportions give each dish a distinctly different flavour even when the same ingredients are used. That said, the final master stroke in most South Indian dishes is the zesty tempering of mustard seeds, asafoetida and curry leaves, which gives the food a trademark South Indian seal! Each nook and corner of Tamil Nadu has a different food story to tell, and we realise now that it’s a mistake to try and cover it all in one article, so we urge you to read more about each of these cuisines (Andhra and Telangana, Kerala, Tamil Nadu and Karnataka) and recreate the magic in your own kitchen using our authentic recipes. In India there is so much variety in each cuisine that it is difficult for an individual to entirely master their own cuisine. Just when you think you know all your native foods, someone busts the misconception and widens your horizon by sharing yet another treasure! While we focus on our own cuisines, we should also try and set aside at least a day every week to try the culinary gems from other Indian regions, so that we grow to appreciate the unity in diversity. Enjoy our South Indian Recipes, 950 South Indian Dishes, Food Recipes and other South Indian Recipe articles below. This honeycombed pancake traces its origins to India's Western costal district, the Konkan. Straight from the kitchens of andhra pradesh, this delicacy is extremely liked and very frequently consumed there. 'pappu' means dal in telegu and has been combined here with gongura and moong dal. This "akkara adisil" is a sweet of iyengar cuisine prepared on the koodaravalli day (27th day of margazhi) and offered to the lord. Enjoy the iyengar famous akkara adisil (akkaravadisal). This also serves as a substitute for plain wheat rotis. .
Amani kozhakatai, these delicately-seasoned steamed rice balls are made as an offering during ganesh chaturthi in tamilnadu, but they can be served as a low calorie snack anytime! A great way to utilize over ripe and blackened bananas. Its tasty, healthy and a good snack or even complete meal for this rainy evenings. Thanks for your big collection of South Indian recipes. So true about your statement of rice holds a special position in the South Indian kitchen. Have tried your 4 flour dosa which our entire family loves. Tarla Dalal Hi Sheetal, Thank you for your kind words. Happy to know you loved the information we shared. Do try more and more recipes and share with us your feedback. Our office is providing evening snacks for all staff everyday in which 2 days is for South Indian snacks in a week i.e. idli & some day dosa. My colleague has given Tarla Madam idlis & Dosas recipe printouts to our office maid. Now she is referring to different variety of Tarla Dalals idlis & Dosas recipes. She enjoys making it because of simplicity & perfection of each recipe and we all enjoys eating fresh, hygienic and tasty snacks. Their are lots of Tarla dalal''s delicious south Indian dishes that are made at my home. I loved that tadka aroma of curries, chillies and many other spices used while making spicy & savory dishes. Sweets pongal, Paal Payasam, rice pancakes is NO.1, which we make it at home and all liked them very much. Tarla Dalal Hi Krutika, That is amazing! Thank you for your kind words. Happy to know you loved the information we shared.